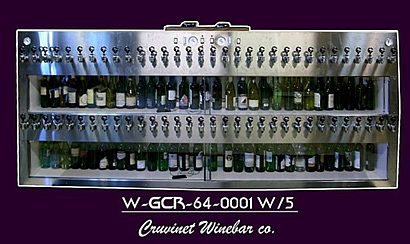 Cruvinet Systems can make custom Cruvinet Wine Bars with as many as 120 faucets to fit your special request. Custom Cruvinet units come in wood, polished or satin stainless steel finishes. We also make custom curved Cruvinet units with up to 30 faucets each, available in polished or satin stainless steel finish. Send us a drawing of you floor plan and the Cruvinet engineers will work with you in designing a unit to fit your unique needs. Use the form on the Contact Us page or simply e-mail us at and attach your drawing. One of our representatives will contact you within 1 business day.